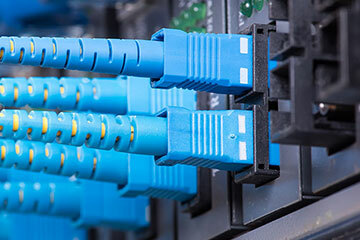 Our client is a leading Canadian telecommunication equipment company. As its core business changed, the company began strategically consolidating operations, resulting in surplus data center, networking, research & development, and production assets around the globe. Looking to implement globally consistent and compliant methods for managing its surplus, the company sought an experienced partner to provide comprehensive solutions, proven processes, and desired sales results. The company selected Liquidity Services to maximize value in its reverse supply chain while ensuring compliance. Working closely with the client, we implemented a proven, standardized asset management process. Through this program, we manage, value, and sell client surplus across North America, Europe, Africa, and Asia. Liquidity Services seamlessly executes every stage of the client’s asset management program, from inventory to sale. Our scale and expertise enable us to manage a wide range of client asset categories, including test & measurement equipment, networking and computer assets, and vehicles. We conduct auctions every month and additional sales events as needed, leveraging proven multichannel marketing strategies to maximize buyer interest in the client’s surplus. Because the client is unable to sell or offer pickup from its facilities, we store its surplus in warehouses across North America and arrange payment, shipping, and removal. Compliance is integrated into the client’s program. Liquidity Services identifies all assets with potentially sensitive data early on and removes it as appropriate, ensuring that the client’s assets are never sold containing confidential information. 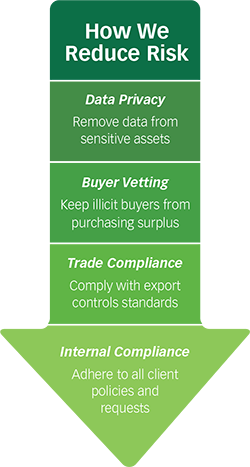 Our buyer vetting services include screening all buyers against more than 200 global restricted-party lists. These lists include suspected terrorists, criminal enterprises, and targets of political and economic sanctions. This comprehensive screening process lets the client rest assured that its assets will never be sold to improper buyers and locations or for improper end uses. Liquidity Services also mitigates client risk by complying with its internal requirements. We submit to regular security and environmental, health, & safety audits and assume most of the risk for any compliance violations. Since this partnership began in January 2014, Liquidity Services has generated nearly $4 million in sales proceeds for the client. This figure is almost 20% above the minimum values approved by the client. Our global buyer base has driven these superior results, as we’ve sold surplus to buyers in 15 countries on four continents. We’ve also helped the client close facilities, labs, and data centers around the world. By partnering with Liquidity Services, the client ensures compliance in the reverse supply chain, virtually eliminating risk. A complex array of regulations governs the management, valuation, and sale of surplus. Rather than navigating this area alone, the client wisely decided to shift the risk and responsibility to an expert provider. Liquidity Services ensures that the client generates an ongoing capital stream and stays compliant with all applicable regulations in the reverse supply chain, allowing it to focus on core business. We’ve sold our client’s surplus to buyers in 15 countries around the world. Client A leading Canadian telecommunication equipment company. 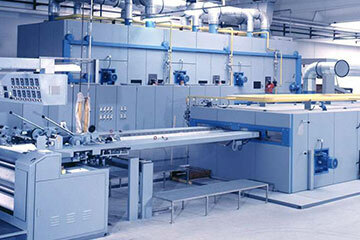 Our client is one of the world’s leading electronics manufacturing services companies. 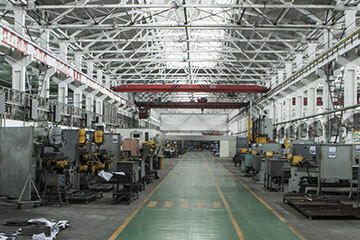 Our client is a high-tech optical communications technology and test and measurement company. A large, global, semiconductor company had 70 vacuum pumps stored in one of its sub fab facilities, where they had been idle.